Suffolk County Cockroach Removal Experts | EcoTech Pest Control Inc. 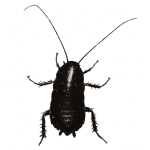 The ORIENTAL COCKROACH is the second largest roach found in the United States. They often will infest sewers and cesspools, as well as nesting just beneath the surface of concrete and blacktop outdoors in warmer months. When nesting outdoors, they will come out in the open at night to feed, often scaling the walls of buildings that meet the edge of the blacktop or concrete that they are nesting under. When the colder months approach, they begin looking to overwinter indoors; following sewer and gas lines that run below ground into the structure. Once infestation begins INDOORS, they generally stay confined to basements and crawl spaces; however they will follow plumbing and electric lines, turning up sporadically throughout the structure. The ORIENTAL COCKROACH doesn’t breed as quickly as the GERMAN COCKROACH, but breeds faster than the AMERICAN COCKROACH. Their droppings, when concentrated, can produce a musky odor, which is a sign of infestation. They will find food sources just about anywhere. ORIENTAL ROACHES, like all roaches, are a threat to carry and spread disease. Furthermore, many people, especially children, can develop allergies to their droppings and shedding. Over time, roaches have developed a resistance to many common pesticides, and trying to treat the problem if you are not properly trained can lead a spread of the infestation as well as exposing yourself and others to harmful chemicals. IT IS NOT RECOMMENDED THAT YOU TRY TO TREAT A ROACH INFESTATION ON YOUR OWN. A TRAINED EcoTech Professional will eliminate the infestation without causing a spread of the infestation OR exposing you and your loved ones to harmful chemicals.